The crow is a staple in primitive folk art. Whether carved from wood, made of cloth, appliquéd on a quilt or pennyrug, the crow is a common theme used by primitive artists. Crows are generally portrayed in art as solid black. Yet in color, the Common (American) Crow is very distinctive. They can be lightly flecked with violet blue on a background of black and even have metallic violet feathers. In some lights, there is a gloss of reddish violet or even a greenish cast to their feathers. 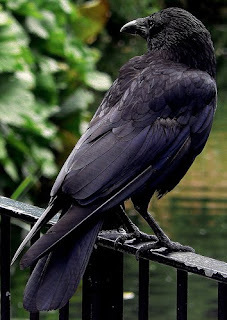 It really makes me want to get in the studio and make a crow – a beautiful crow with hints of metallic violets and greens that would shimmer and glow in the sunlight. They are amazing birds close up. So big. And, like you said so many colors in their feathers, not just black. Our Red Wing Blackbird keeps them all out of the yard. Like a ace bodyguard he is on the attack when anything like a crow or hawk appear in the sky. The other birds seem to like his style. Thank you for lovely message and support. I will continue to do art art. We all need to continue to do what we love.